Los Angeles Clippers fans hold up signs protesting owner Donald Sterling at the Staples Center on April 29. UPDATE (May 29, 7:45 p.m.): The Los Angeles Times has reported that Steve Ballmer, former CEO of Microsoft, will purchase the Clippers for $2 billion. Earlier this month Nate Silver wrote about team valuations in the NBA, and whether the Clippers were worth more than was commonly believed. The original piece is below. A billion dollars? For the Clippers? That’s the price my Grantland colleague Zach Lowe’s sources are saying the Los Angeles NBA team could fetch if its current owner, Donald Sterling, agrees to sell the franchise or is forced to do so. With stars from Magic Johnson to Floyd Mayweather, Jr., to Oprah Winfrey to Larry Ellison reportedly interested in a piece of the club, it’s not hard to see why league officials have starry-eyed visions about what the team could be worth. And yet, when Forbes Magazine published its valuations of the 30 NBA teams earlier this year, its figure for the Clippers was considerably more modest: $575 million.1 NBA officials, I’ve found in the past, aren’t fond of the Forbes figures. The league has incentives to underplay its financial performance when in the midst of a labor dispute, and to frame its finances in a more favorable light when it has a couple of franchises up for sale. In this case, however, there’s reason to think Forbes considerably undervalues the Clippers. You might describe why with the old real estate adage: location, location, location. It’s not breaking news that there are lots of people with lots of money in Los Angeles and its suburbs. What’s more interesting is that the number of billionaires in a given community historically has been a strong predictor of the degree to which its NBA franchise appreciates in value. 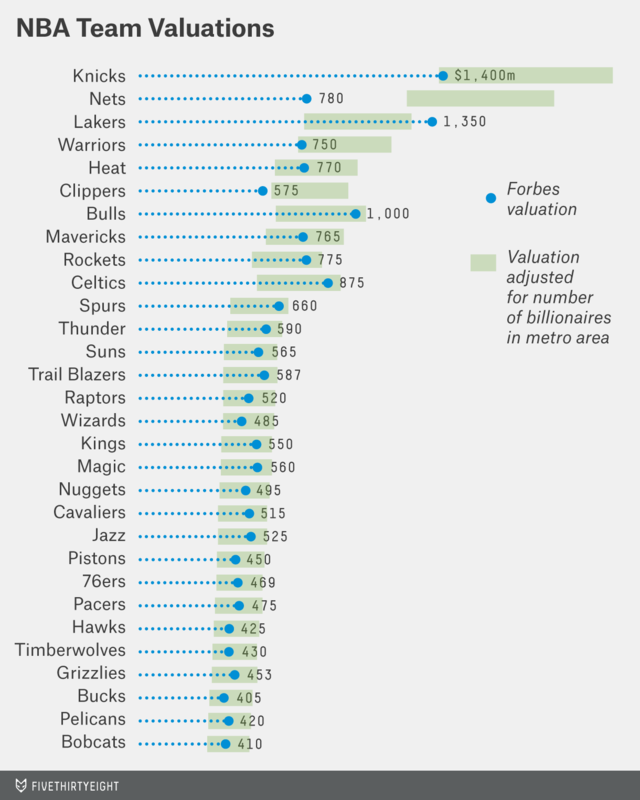 Take a look at the annualized change in NBA franchise values from 2004 to 2014, according to the Forbes estimates. In the chart below, we’ve highlighted the teams that played in metro areas that had a gross domestic product of at least $250 billion as of 2004. You can see that there’s a relationship. The New York Knicks, despite their mostly poor play over the past decade, saw their franchise value appreciate by 13.3 percent per year, according to Forbes. The Lakers and Clippers saw theirs grow by 11.7 percent and 10.7 percent per year, respectively. 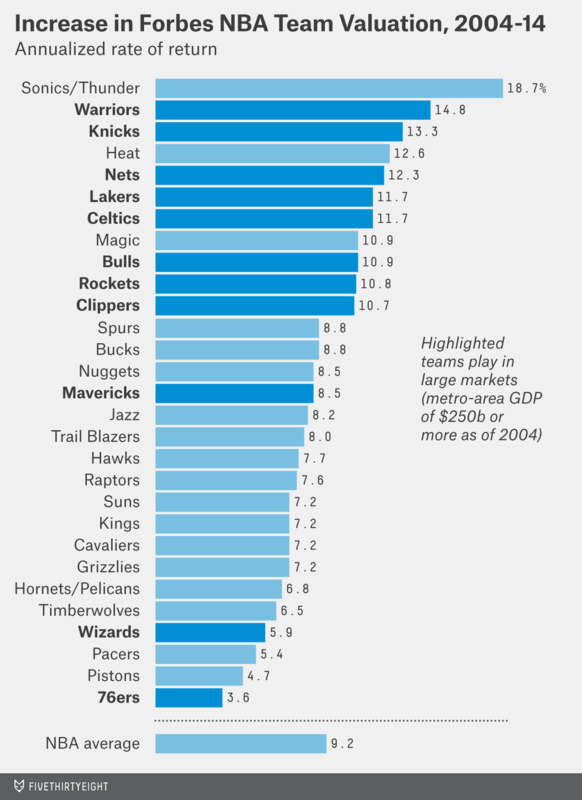 Most other big-market teams, like the Chicago Bulls and the New Jersey/Brooklyn Nets, have also done well. There are also some exceptions to the pattern, the most obvious being the Seattle Supersonics, who saw their franchise value increase a lot after moving to Oklahoma City and becoming the Thunder.2 The Miami Heat, despite playing in a mid-sized market, have seen a massive increase in franchise value. On the flip side, the Philadelphia 76ers and Washington Wizards have considerably underperformed the rest of the league despite playing in reasonably large markets. The correlation between the rate of increase in franchise value and the number of billionaires in a metro area has been reasonably strong,5 as I’ve mentioned, with the Sonics/Thunder representing the main outlier. This helps explain why the Golden State Warriors have seen their value increase so much, for instance. The San Francisco-Oakland metro area6 ranks 11th in the U.S. in population and eighth in gross domestic product. But it has ranked second or third in billionaires, behind only New York and sometimes Los Angeles, depending on the year. Why do we see this relationship? Owners of sports franchises tend to hold onto their teams for a long time — the average NBA franchise last changed hands 14 years ago. In a period that long, the player roster will completely turn over, perhaps several times. The coaching and front office staff will very likely turn over, too. A team’s uniform might change; its nickname might change; it might move into a new arena. What’s a lot more permanent is a team’s home city. Franchises can move, but that doesn’t happen often. The Clippers’ greatest asset isn’t Chris Paul or Blake Griffin. It’s the City of Los Angeles and the billionaires who live there. It’s also worth contemplating whether cities that attract hedge-fund billionaires and oil barons have an intrinsic advantage in recruiting multimillionaire NBA players. Compare Miami and Philadelphia, for example. Philadelphia’s gross domestic product is about 33 percent higher. But — and meaning no offense to Philadelphia — Miami is presumably a lot more fun for a really rich person. Miami will still have South Beach long after LeBron takes his talents to the next town. It will also have no state income tax. But if NBA franchises in billionaire-rich cities can be counted on to appreciate at a higher rate, shouldn’t the market account for that? In other words, shouldn’t they be selling at a higher value to begin with? Keep in mind that we’re looking at Forbes’s estimates of franchise values and not actual sale prices. It could be that Forbes is lowballing the values of big-market clubs. We don’t get all that many data points on actual sale prices because the rate of franchise turnover is low, and because the transactions are often complicated and involve other assets that are bundled with the sports teams. However, the Los Angeles Dodgers (along with some real estate assets) sold for $2 billion two years ago, a figure that far exceeded Forbes’s estimated value of the MLB team. The coefficient on the 2004 franchise value variable is statistically significant and negative. What that means is that a franchise can be overvalued by Forbes, and prone to seeing its value revert to the mean, when that value is out of line with the number of billionaires in the area. We can use this regression equation to create estimates of NBA franchise values that may be more reliable than Forbes’s. (The process for this is explained in the footnotes.9) I calibrated the estimates such that the average value of an NBA franchise is the same as what Forbes lists — about $630 million. (The NBA would probably contend that Forbes’s estimates are low across the board — based on the recent sale prices of the Sacramento Kings and the Milwaukee Bucks, for instance — but our interest here is mainly in seeing how franchises are valued relative to one another.) Because the estimates are not all that precise, I’ve listed them as a range based on their standard error. For the Clippers, for instance, the range runs between about $580 million and $950 million. So the billion-dollar estimate might be a little high, but the Forbes valuation of $575 million is probably too low. There are two other teams whose Forbes valuations fall outside the recalibrated range. One is the Brooklyn Nets, which our formula estimates is worth between about $900 billion and $1.5 billion, and not the $780 million that Forbes estimates. Perhaps Mikhail Prokhorov knows what he’s doing in throwing his resources behind establishing the Nets as a major brand in New York. The number of billionaires in New York continues to skyrocket — so he’ll have plenty of people to sell the franchise to at a profit down the line. The other team that falls outside of the range is the Lakers. The formula implies that their Forbes valuation, at $1.35 billion, is a little too high. I personally don’t think the Lakers would have much trouble selling for something in that range if the team were put on the market today. But the logic behind the calculation is something like this: Sure, the Lakers have a much more powerful brand than the Clippers, but they don’t have much of an advantage apart from that brand. The two teams play in the same city, in the same arena. The Clippers have the better roster and a very good coach. 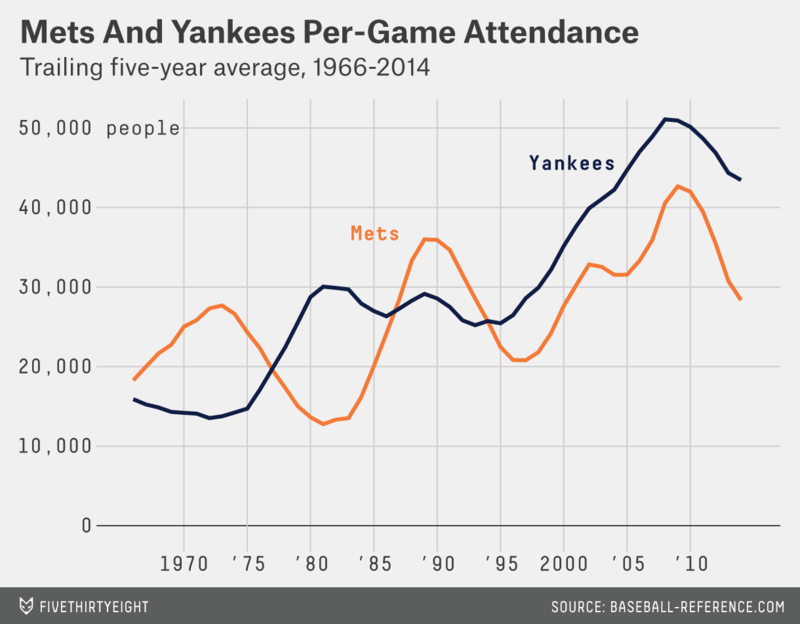 The brand advantage can shift over time: At various points in the past 50 years, for instance, the New York Mets have outdrawn the New York Yankees. Another couple years of Blake and CP3 making deep runs into the playoffs while the Lakers struggle with the albatross of Kobe Bryant’s contract will erode some of the Lakers’ edge. Are the Lakers still worth more? Yes, but the formula implies that they should be worth 20 or 25 percent more than the Clippers — and not 135 percent more, as the Forbes valuations say. Perhaps that means the Clippers are undervalued and not that the Lakers are overvalued. If you’d consider buying the Lakers at the Forbes price of $1.35 billion, and would require a 25 percent discount to take the Clippers instead, that implies you’d pay about $1.1 billion for the Clips. The Clippers’ other big handicap, of course, has been Donald Sterling. But that problem resolves itself the moment he sells. He may be banned from basketball. He may have embarrassed himself and his franchise. But if he sells quickly — before doing further damage to the Clippers’ brand — he could have a billion-dollar check coming his way. Correction (May 3, 11:20 a.m.): An earlier version of the NBA Team Valuations chart misstated what the range in green indicated. It signifies a team’s valuation adjusted for number of billionaires in metro area. It’s not as though the valuation doesn’t account for the Clippers’ recent on-court success. Two years ago, Forbes valued the Clippers at only $324 million. This even though Oklahoma City is a considerably smaller and less wealthy market. The Forbes lists do not specifically break out the list of wealthy people by metro area; I did this by hand. I tried to follow the Census Bureau’s definition of Metropolitan Statistical Areas as much as possible — however, there are some debatable cases. Those interested in using this data for rigorous research should double-check my work and ensure that it corresponds to the particular definition of urban areas that is most suitable for their project. The Forbes 400 list includes data on the United States only. For Toronto, I’ve compiled data from other sources to reflect the number of Torontonians that would have made the Forbes 400 list if Toronto were in the U.S. The correlation coefficient is 0.53, or 0.67 without the Sonics/Thunder included. By the Census Bureau’s definition, this MSA does not include San Jose, Calif., or most of Silicon Valley. The limited supply of sports franchises may also explain why we don’t see much, if any, of a valuation penalty for NBA franchises that play in multi-team markets. The Lakers and the Clippers, like the Knicks and the Nets, compete with one another to some extent for fans. However, there’s an undersupply of NBA franchises relative to the number of billionaires in these large cities. If one of the 77 billionaires in the New York metro area buys the Knicks, there are still 76 billionaires left to buy the Nets. I included the Sonics/Thunder in the regression despite their having changed locations. 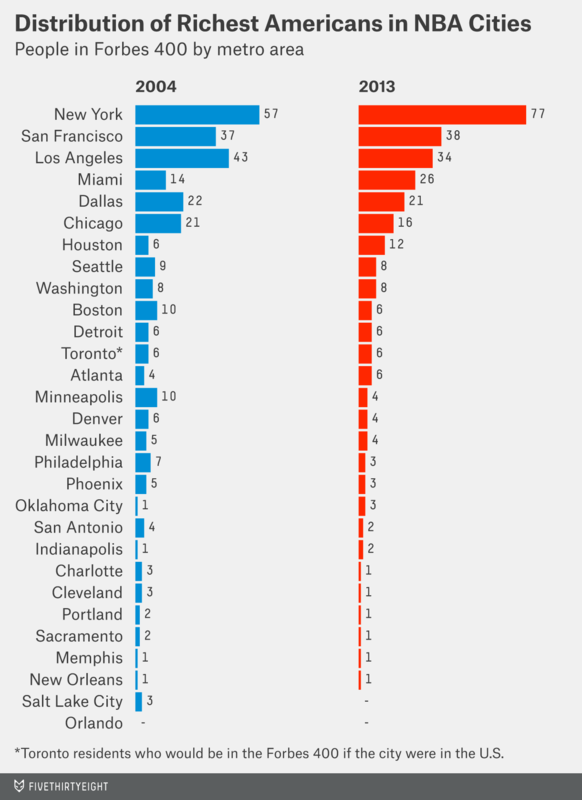 Although NBA franchises change metro areas only rarely and face restrictions when seeking to do so, some of the value in purchasing an underperforming franchise consists of the potential to relocate the team. 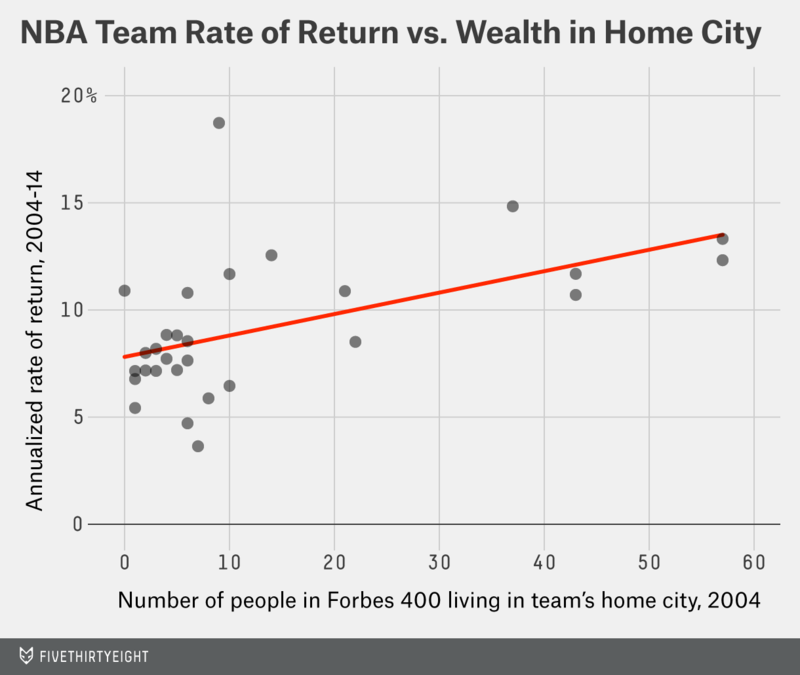 To do this, I used the regression equation to determine each team’s projected rate of return over the next 10 years, based on its current Forbes franchise value and the number of billionaires in its metro area. However, I assumed that rates of return in excess of the league average would be captured immediately and reflected in a team’s potential sale price. This is how a rational market would behave, unless the higher projected rates of return were associated with higher risk.